Ten times since, regulators showed up unannounced at Marty’s house. At one point, an inspector he hadn’t seen before appeared. He hoped things had changed for the better. Here are your tax dollars at work. Some regulation is useful. But when we passively accept government regulation of everything, thinking we’re protecting people from evil corporations run amok, we’re really making life harder for ordinary people. Every profession, from cab driving to floral arrangement, is now burdened with complex rules. You can’t even give tours of Washington, D.C., the city that produces most of these insane rules, without getting a special license. Tour guides must pay about $200 for criminal background checks, provide four personal references, show passport photos and pass a written test — a difficult one. People who reflexively defend government may feel no pity for businesses that face extra costs: Let businesses pay fees and take tests — we don’t want unlicensed tour guides describing famous statues incorrectly! But these costs add up. Often, they make a small, barely profitable business impossible to operate. These rules also violate Americans’ right to free speech. They are unnecessary. If tour guides are no good, people can patronize others. The government doesn’t need to be gatekeeper. These rules generally prevail because existing businesses are politically connected. They capture licensing boards and use license rules to crush competition from businesses just getting started. In some places, you can’t open a business like a limo service or moving van company unless you can prove that your business is needed and won’t undermine existing businesses in the same field. But undermining competition is the whole idea. If Starbucks or Home Depot had to prove new coffee shops and hardware stores were “needed,” we wouldn’t have those companies. Apparently they were needed, since these companies thrived, but no one could have “proven” that beforehand. The little guys don’t have an army of lawyers to defend those islands of liberty one regulatory battle at a time. We should get rid of most of these regulations — and sail back, together, to a free country. John Stossel is a consumer reporter, investigative journalist, author, libertarian columnist, and former co-anchor for the ABC News show 20/20. In September 2009 Mr. Stossel left ABC News and joined Fox News Channel and Fox Business Network. He is host of “Stossel” on the Fox Business Network. Visit his blog at stossel.blogs.foxbusiness.com. Posted at RealClearPolitics.com on November 20, 2013. Reprinted here January 9, 2014 for educational purposes only. 1. The purpose of an editorial/commentary is to explain, persuade, warn, criticize, entertain, praise or answer. What do you think is the purpose of Mr. Stossel’s editorial? Explain your answer. 2. 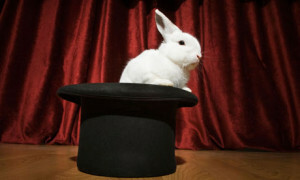 What two words do you think best describe the regulations placed on Marty the Magician? (e.g. necessary, important, well-meant, ridiculous, foolish, overbearing, etc.) Explain your answer. "Some regulation is useful. But when we passively accept government regulation of everything, thinking we're protecting people from evil corporations run amok, we're really making life harder for ordinary people. Every profession, from cab driving to floral arrangement, is now burdened with complex rules. ...We should get rid of most of these regulations." a) Do you agree with his assertion? Explain your answer.